At the heart of project management is organization. We strongly feel that structure is broken in other platforms, which is why created the ClickUp hierarchy. At first, it can be a bit daunting, but in practice it actually makes life much easier. Once you start with structure, you'll always have it. And once you're used to it, you'll love it. Your Teams are the top level. 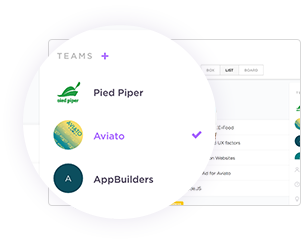 You can join or create as many Teams as you like - and easily switch between them in ClickUp. Each ClickUp team is entirely separate from each other. Spaces are the second level and allow all of ClickUp's customization. ClickUp makes it easy to switch between Spaces so you can have completely different workflows from Space to Space. 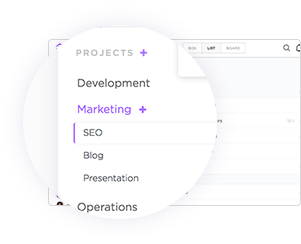 Each Space is located across the top of your workspace, displaying Projects and Lists in the sidebar. Try dragging and dropping your Spaces in order from most to least used! The sidebar is made up of Projects and Lists. Basically, Projects are folders acting as a way to group and organize Lists of tasks. Projects are groups of Lists, which contain tasks. 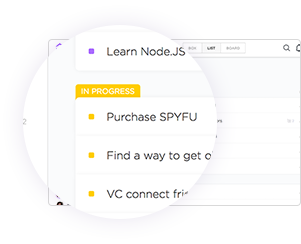 Every Task in ClickUp is located within a List. Lastly, this brings us to tasks, which are at the bottom of the hierarchy, but form the most important part of ClickUp. Tasks inherit traits from Spaces, and again, are located within a List. You can change where a task is located at any time, but if you want to change workflow settings (like Custom Statuses) then you'll need to change them for the whole Space or Project. Assigned Comments occur within tasks. They work as an action item that will notify an assigned user that a he our she is responsible for resolving a comment. Assigned comments provide a fool-proof way of never losing track of an task, as they will remain visible until resolved. And of course, Subtasks are within parent tasks. A subtask carries the same traits as the parent task and Space that it is in. If your Space has Custom Statuses and multiple assignees, your subtasks will as well. Checklists are essentially simple, nested subtasks. Checklist items have the simplest statuses (either done or not done), and can easily be dragged and dropped between checklists.